NASCAR driver, Danica Patrick, has been in the headlines recently for becoming the first woman to secure pole position in NASCAR Sprint Cup history. With so much attention - and praise - being heaped her way, questions on whether she could be successful in Formula One are being floated. But the consensus among people in F1 seems to believe that Danica Patrick isn’t good enough to compete at their level. 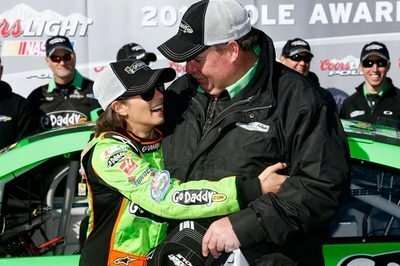 One voice that shared his opinion on Danica’s chances of success should she race in Formula One was Dr. Helmut Marko, the driver manager at Red Bull, who above all else, questioned her credentials. "You have to look at Danica’s results in the road races," he said. "It’s not enough." "We are looking for drivers based on performance, not by quota," Marko added. Triple world champion and Mercedes chairman, Niki Lauda, also weighed in and was a little more diplomatic about his answer, saying that it wasn’t so much Danica Patrick’s skill set, but more about the technical level of Formula One and how U.S. drivers wouldn’t be able to cope with the technical side of F1 in general. "The last American who had success in Europe was Mario Andretti — and that was in my day!" exclaimed the 63-year-old. Lauda, however, wasn’t closing the door on a female driver racing in Formula One, saying that they should get a chance if they have the kind of skills to allow them to be successful in the series. If for nothing else, having a female on the F1 grid will boost the sport’s popularity exponentially. Lauda was even quoted by the Bild daily saying that "if we could get a woman into the top six, you would immediately have twice as many fans in front of the TV". "For ten years," Lauda added, "I’ve told Bernie Ecclestone he’s dopey for not getting a woman into Formula One." But, at least as far as the F1 folks opine, that ’woman’ isn’t Danica Patrick.